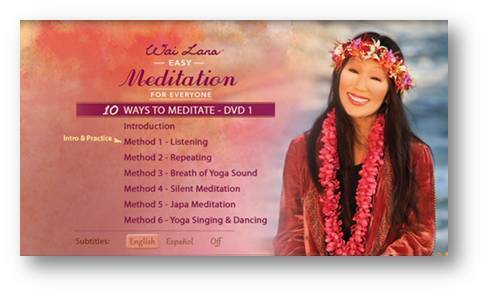 I am glad to share my wonderful experience from the Wai Lana’s Easy Meditation kit for everyone. I love this Meditation kit and I would say anyone gets this will be glad to have it. I like this DVD Series starting from the packaging, design to the content of it. 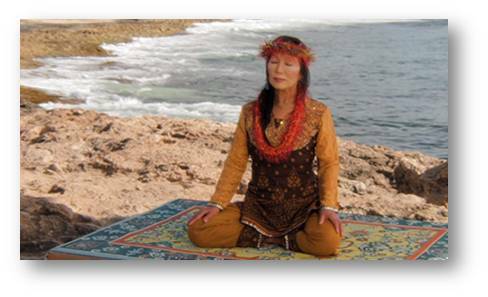 Practicing this meditation with Wai Lana gives immense pleasure and restfulness to the heart. I liked the packaging of this product very much. It’s done in a nice creative way; there is a ribbon to open the covering, which makes it more stylish. The beautiful color, picture of Wai Lana and the description about different methods in the cover page makes it more attractive. The cover is so strong that the DVDS, booklet and the beads inside it are totally protected and safe. I ordered this Meditation Kit from abroad and received as it is just because of the sturdy packaging. She has included 2 DVD’s with 10 different methods to practice the yoga sound meditation which are very easy to follow as it is self-explanatory. She has included a booklet with the clear description on the methods with some more description and the best way to practice yoga sound meditation. 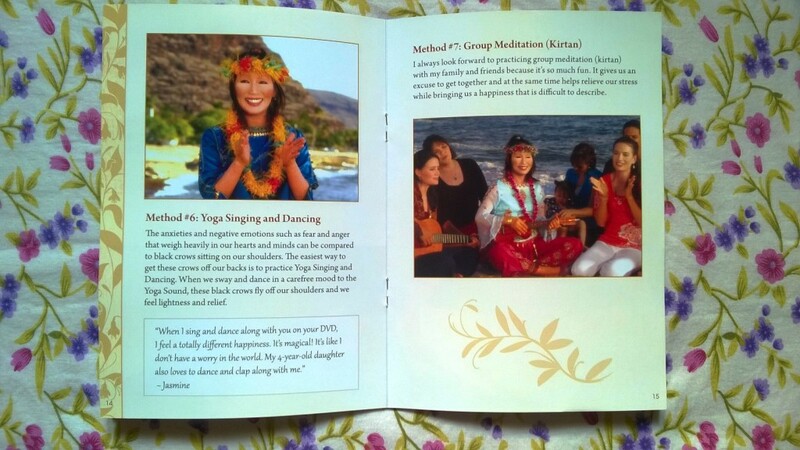 The booklet with nice pictures and description makes me excited to watch her videos and believe me I could not stop watching Wai Lana Yoga Asanas again and again and I love practicing with her. Wai Lana has arranged the methods in such a nice way that, it is very easy to navigate. For each method she has included the “Practice Only” and “Intro and Practice”. Though the intro and practice takes bit more time than the practice only, it helped me a lot to learn the methods at the initial stage and gradually I do it with the practice only. She has the variations of language available for the subtitles as well. Her smiling face, pleasant voice, soothing expression, natural scenic beauty motivates me to start the practice with her and helps me to experience the innumerable benefits from this practice. With my busy life I always used to feel stressed, restless and I didn’t find much solutions to have a stable and focused mind, but practicing different methods of yoga sound meditation with Wai Lana, helped me a lot to focus on these sounds, to get deep inner peace and happiness, helps me relieve stress and to get rid from all the worries, anxieties in my life. Now it has become a habit to take out at least 20 minutes a day to practice yoga sound meditation in a secluded place which gives me a good start of the day. I must tell that the nice part about Wai Lana Yoga teaching is we can practice many of the methods at any place, any time. This helps me to practice few of the methods in the break time at work, in the traffic, during the long travel in train or flight or while resting. While demonstrating the methods for meditation she not only focuses on the meditation, but comfort of the body as well. To maintain the safety of the body she guides the usage of props and guides to arrive at a comfortable position where we don’t need to focus on our body any more but can focus on the sound. I used to think meditation as a method to sit in a secluded place and to focus on the void, but this was the most difficult thing to do as my mind used to get distracted very fast towards many other thoughts. Listening to her I could know that meditation is to focus on the transcendental sound putting aside all the worries of life. And now I could very well feel this practice of yoga sound mediation slowly removes all other tension from my mind. I play this sound always while working and traveling and this sound helps me get relaxed and rejuvenated. I would say you will love to know that any one and every one can practice this at any place and any time. After practicing the methods with her, I could say that only thinking and knowing about it does not helps much, but practicing this meditation gives the benefits and helps to achieve inner happiness. She takes baby steps to teach the methods which make it very easy to remember and practice. She is not imposing any hard and fast rule for any of the methods but allows doing it with our own comfort. That gives me interest to go with my speed. The process of practicing Wai Lana’s meditation methods itself is so calming to the mind that I feel to do it again and again. This encourages doing it in between the day time by taking small breaks. Usually I get stressed in between the day with the normal office work pressure, health issues, new endeavors in life etc; but practicing the “Breath of Sound Meditation” has such a nice impact on the body and mind, this helps to regain composure from all kind of nervousness and stress. I got the confidence on Wai Lana’s meditation practice at the first place as no where she focuses on the self-made methods but she refers to the ancient scriptures and the self realized disciplic yoga masters. I feel the yoga sound meditation as the personal companion on which I can take full shelter and can have full faith. I have found many a situations and many a people who have given me strength and hope in my critical situations. But none of them were permanent. Sometimes or later I used to feel shelter-less too. I used to get frustrated by not getting anything on which I can take shelter. But after practicing different methods of meditation I realized this sound meditation by Wai Lana is the everlasting, ever existing, ever supporting and ever refreshing method. Practicing japa meditation in the morning helps me to get a calm and clear mind to start the day and I feel very happy for the whole day. It is very easy to understand and practice this method as she explains very slowly and clearly with all possible kind of instructions. Very nice thing about japa meditation is that, there is no hard and fast rule for doing this practice. So this helps me to get more focused being in my comfortable position while practicing. 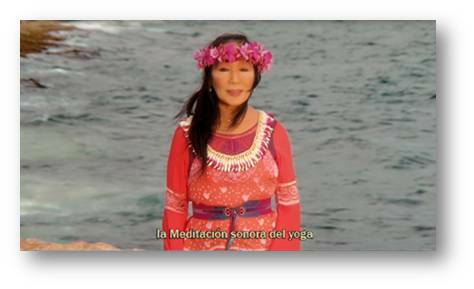 Doing the Singing & Dancing with the Yoga sound part with Wai Lana is amazing. When you will listen to her voice, it’s really heart touching. I found this method as the easiest method to focus on the sound. After a busy day when I try to do this practice in the evening with my friends and family members; this simply removes all kind of anxiety, worries, and hatred, anger which gets created throughout the day from doing other stuffs and simply gives inner happiness. This practice helps me to have a peaceful end of day. I found the chakra meditation as a bit difficult method to focus, but the practice of other methods helped me to gain focus and I could practice this now. The placing of the transcendental sound on different Chakras of the body while focusing on it gives a wonderful experience on both the body and mind. Hearing different kind of yoga sounds and the quotes from the ancient yoga scriptures gives a realization about how polluted my mind is and the path to be more humble and to gain focus and faith on the yoga sound to get purified from all those contamination. Looking at scenic beauty and her effulgent face – my eyes gets satisfied, following her guidelines makes me very comfortable. The body gets relaxed and listening to the sound from her lips the mind gets peace, happiness and blissfulness. She has methods to have a nice start of day, methods to practice in between the day and to have a nice end of day. I would say you will love this DVD series in all ways. 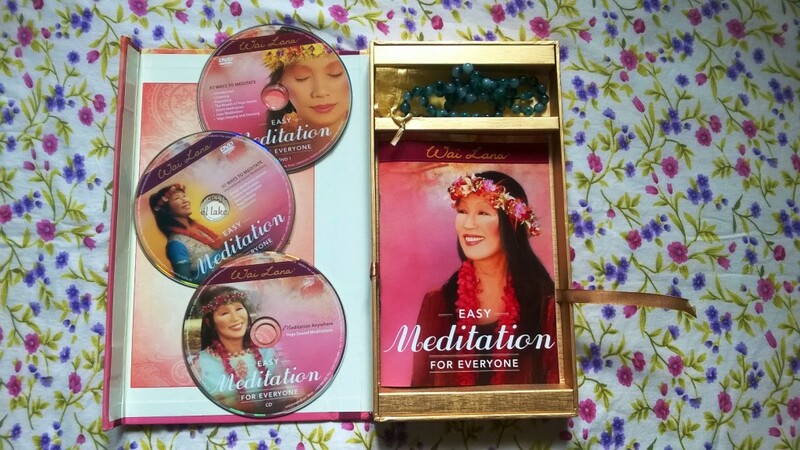 Thank you very much dear Wai Lana for this wonderful gift of Easy Meditation for everyone Kit. Thank You friends for reading this review. Hope you find this useful for your meditation practice. “Namaste” music video by Wai Lana. Enjoy and Share! 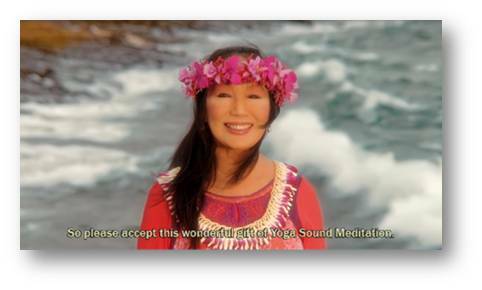 Wai Lana Yoga Singing and Dancing to Get Relaxed and Fully Refreshed!